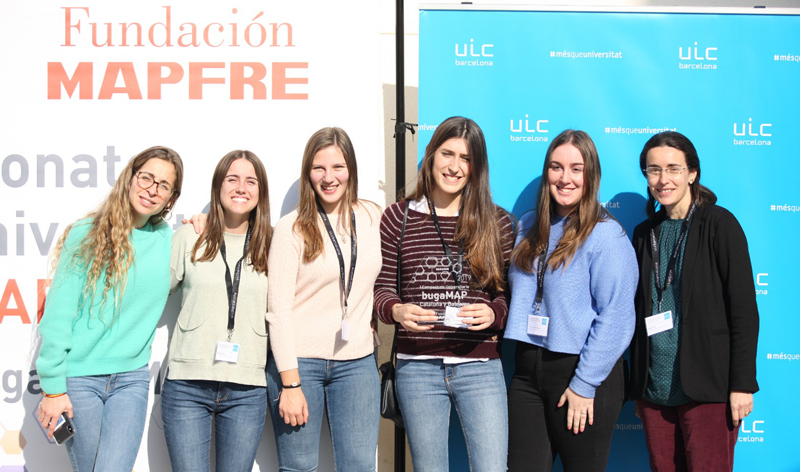 A team of five female students from the Faculty of Economics and Social Sciences at the Universitat Internacional de Catalunya (UIC Barcelona) has won the BugaMAP championship. The final of this Fundación MAPFRE championship was held this Thursday at the university’s Campus Barcelona. During the several stages of the championship, six seminars were held in which 145 students took part from UIC Barcelona; the Universitat de Lleida; the Universitat de les Illes Balears, the Universidat de Girona and the Universitat Abat Oliba CEU. The dean of UIC Barcelona, Dr. Xavier Gil, handed out the prizes together with the dean of the Universitat de les Illes Balears, Dr. Llorenç Huguet; the Head of Institutional Relations and Network Development at MAPFRE, Sergio Sánchez and Fundación MAPFRE’s representative in Barcelona, Javier Solís. The award ceremony was also attended by the Vice Chancellor of UIC Barcelona, Dr. Toni Mora; the dean of the Facultat de Ciencias Económicas y Sociales de UIC Barcelona, Dr. Marta Mas; the Vice Chancellor of Students and Quality at the Universitat Abat Oliva CEU, Dr. Maite Signes, and the Director of the Departament d’Economia i Empresa of the same university, Rocío Bonilla; the dean of the Economics and Social Sciences Faculty of the Universitat de Girona, Dr. Anna Garriga and the Universitat de Lleida professor, Anna García. During the award ceremony, Dr. Gil thanked all those taking part for their involvement in the championship which shares the same goal as the universities: the transfer of knowledge. Solís remarked that Fundación MAPFRE has been developing BugaMAP for over 30 years in over 16 different countries, “a project which undoubtedly helps young people learn more about the importance of the insurance sector, one of Fundación MAPFRE’s objectives”. BugaMAP, the MAPFRE business game, is a business simulation game that teaches university and postgraduate students from numerous countries how management in the insurance industry works. This is achieved through taking decisions and simulating their impact on the company’s market share, results and solvency. The International University of Catalonia (UIC Barcelona), founded in 1997, aims to offer a high-quality university education and to promote research at the service of society. Connected to the business world and boasting a strong international outlook, it offers 15 degree courses, approximately thirty international qualifications and a wide range of postgraduate courses at its two campuses located in Barcelona and Sant Cugat del Vallès.